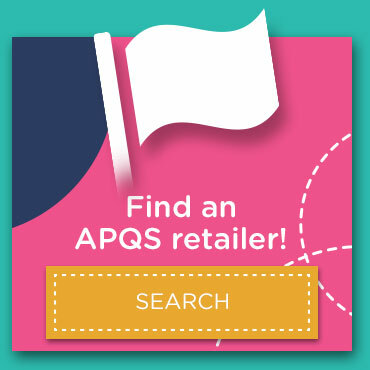 There are multiple optional accessories you can purchase for your APQS quilting machine to further enhance your longarm quilting experience. If you have any questions about the optional accessories listed below don’t hesitate to contact us or speak directly to your local retailer. Click on the accessory below to learn more information. Quilt Path™ is the APQS computerized quilting system that makes precision quilting easy. You design it, Quilt Path™ quilts it. Choose from a vast library of patterns or design your own. From simple pantograph quilting to custom quilt creation, it is all available at your fingertips with the Quilt Path™ touch screen tablet. 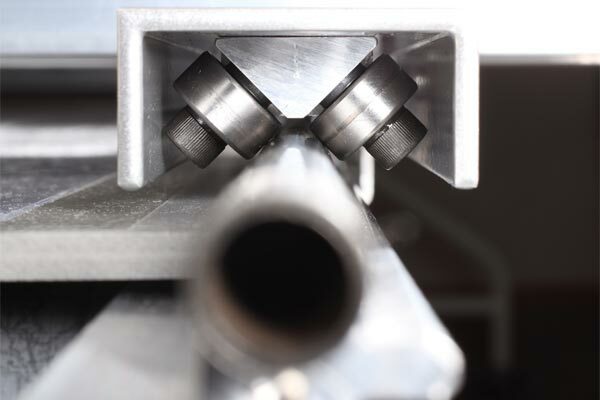 The Bliss™ track system eliminates resistance found in traditional longarm track systems. Specially designed horizontal wheels on the sewing head and roller bearings on the table rails provides smooth, effortless and easy movement allowing you to quilt for hours without feeling tired. The Bliss aluminum alloy table rails are engineered to eliminate the need for truss support. You can choose a table length of 8′, 10′ or 12′ for all machines or a table length of 14′ for Freddie, Millie and Millie30 (or Lucey with an upgraded Deluxe table). You can quilt confidently without worrying about sagging or flexing in the table’s center. With Bliss, you’ll be able to quilt for hours on end without the fatigue felt with cumbersome track systems or heavier machines. Unlike other channel systems on the market, the APQS rail profile prevents dirt and thread build-up so you can spend more time quilting and less time cleaning. No adjustments are needed – all you have to do is quilt. The Automatic Quilt Advance System with foot pedal control lets you advance or back up your quilt with the push of a button or a toe tap on the foot pedal. The motorized advance turns the pick-up roller to move your quilt ahead, saving time. The Automatic Quilt Advance system is available on all Millie and Freddie machines for $1,350. When Lucey is upgraded to a Deluxe table ($2,000) an Automatic Quilt Advance System can be added for an additional $1,350. The hydraulic lift is available as an upgrade to our standard table. It lets you to adjust table height with the push of a button. Front rollers on the table are set up above tabletop level to make it easier to load quilts and provide the option of sitting on a stool at the front side of the table when doing intricate detail work on a quilt. The cost of the hydraulic table Lift is $1,650. The APQS overhead lighting system attaches to the APQS table and provides a dependable light source that illuminates the workspace. Simple to assemble and install, quilters can direct the track-mounted fixtures independently along the track and shine the light just where they need it. The system uses the universal mounting brackets found on each table leg (shared with the motorized fabric advance on some models). Simply slip the overhead rail sections together, align the mounting plates, and use the bolts provided to assemble the system. The lighting track clamps directly to the overhead rail, allowing individual lights to be positioned independently along the track. The lighting system brings the total height of the APQS machine to 82 inches with the legs set as low as possible. If you’re considering this system, be sure to measure the height of your ceiling prior to purchasing the system, especially if they also own the optional hydraulic lift system. The overhead lighting system works with the APQS Millie, Millie30 and Freddie models*, and is available for an additional $795. *Overhead lighting can be added to Lucey if the system has been upgraded to a Deluxe table. Quilt easier with the APQS Quilt Glide Stitch Mode feature. Quilt Glide combines manual sewing mode and stitch regulation mode to give you accuracy and consistency without that “jerky” feeling that is common when trying to do detail quilting in regulator mode alone. When engaged, the Quilt Glide keeps the needle moving up and down in stitch regulation mode, even when you stop moving the quilting machine. Since the needle continues to stitch when Quilt Glide is on, you’ll feel like you’re gliding through your design like smooth pen strokes. Add the Quilt Glide Stitch Mode feature to your new Millie, Millie30 or Freddie for only $1,250*. *The feature can also be retrofit to most 2008 or newer Millie or Freddie machines. The 8′, 10′, 12′ or 14′ foot deluxe table with adjustable height comes standard with Millennium, Millie30 and Freedom. It can be added to Lucey for an additional $2,000. The Deluxe table lets you dial in the perfect height for you. The APQS table is full of great time saving features. For example, the quilt top, batting and backing all load from the top. This simplifies bobbin changes and lets you quilt while sitting. Our tables do not have junction points in the rails or the poles, which giving our wheels smooth movement and prevents sway. Comes standard with Millie, Millie30 and Freddie. Can be added to Lucey for an additional $2,000. Three additional feet designed to increase visibility for applique, micro work, and general quilting. This complete accessory kit includes the “Clog” foot (designed for both rulers and detail work), the “Flip Flop” foot (perfect for guiding around applique‚ patches freehand) and the “Sneaker” foot (maximum visibility for detail work when rulers are not required.) Additional mounting screws and attachment wrench are included, along with a handy scissors for trimming stray thread. Foot options can be purchase individually as well. The cost of this kit is $299. Three additional feet designed to increase visibility for applique, micro work, and general quilting. This complete accessory kit includes the “Platform” foot (designed for using longarm rulers on George), the “Saddle Shoe” foot (includes an open toe for better visibility while allowing for use of longarm rulers on the sides) and the “Peek A Boo” foot (maximum visibility for detail work or general quilting when rulers are not required). Additional mounting screws and attachment wrench are included, along with a handy scissors for trimming stray thread. Foot options can be purchased individually as well. The cost of this kit is $365. Detailed quilting is a breeze when you add these small “micro drive” handles to your APQS machine. 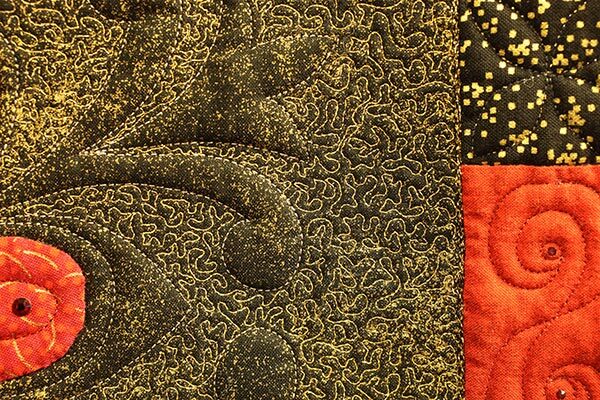 Add to your APQS machine when you want extra control and precision for small detail quilting such as microstippling. These handles mount easily to your needle bar, and raise up out of the way for normal quilting. Use with the optional Hartley Extended Base for added support under the quilt. The Fence is a longarm quilting attachment that lets you to quilt perfect diagonal lines, circles and intricate designs. The Hartley Fence includes a fully adjustable fence guide with metal straight edge that will not warp or wear, an idler arm and wheel. Also includes, circle attachment for making any size circle up to 22 inches in diameter. Includes all the tools needed to assemble an APQS machine, along with basic repair parts. Have the tools you need to assemble and maintain your APQS machine in one kit. This package contains screwdrivers, box end wrenches,an eye loupe and Allen wrenches sized to fit your machine and table. It also includes spare parts such as extra cover screws, needles, needle bar screws and more. Mount thread cones near the front of your machine for easy access from the needle side. Spend less time changing threads when working on the freehand or needle side of your machine. This double spool holder moves your cones to the front of your machine, making quick work of color changes. Works for all APQS machines. When using the spool holder, your thread will pass directly to the 3-hole thread guide by your tension assembly. Stack-wound spools and decorative threads mount easily on the top of the machine for better results. Specialty threads and other decorative threads often come on small spools designed to release the thread by spinning. The dual horizontal spool holder allows you to mount two spools at once, providing optimum performance. Single Heavy Duty 4-inch Locking Caster for APQS Tables with Round Tubing Legs. Heavy Duty 4-inch Caster for APQS quilting machines let you move your machine easily in your room. These Casters will only fit tables that have round tubing legs – they will not fit in square tubing leg tables! Be sure to order 4 casters–one for each table leg. Caster locks to keep the machine in place when quilting. Caster mounts in place of the table glides included standard with each machine. The table can still be leveled with casters installed thanks to the extra long threaded leg inserts. However, table level may be affected if the table is rolled to a different location. Casters raise your quilting machine up 4 inches from its lowest position, which may make the height uncomfortable for very petite quilters. Not recommended for use with a hydraulic lift. Cupped foot designed for easy transitions on and off the quilt top. 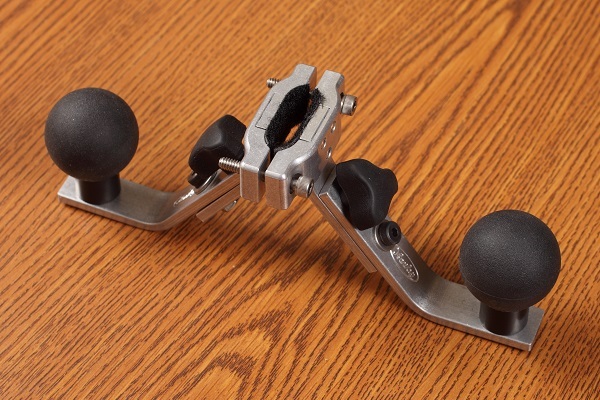 Cupped foot specially designed for stand-up quilters who do pantographs and use Quilt Path. The rounded bottom helps prevent the quilt’s edges from flipping over as you move off the quilt and back on again with your quilting design. High profile edges accommodate thicker batting as well as thin batting. Foot works on any APQS machine already equipped with an interchangeable hopping foot. © 2016-2019 APQS. All rights reserved.